Here was buried Thomas Jefferson - author of the Declaration of American Independence - of the State of Virginia for Religious Freedom - and father of the University of Virginia. Nothing about being the two-term third President of the United States - and that's the way he wanted it. Jefferson was far more proud of starting the University of Virginia - which he envisioned as a free, public university - than he was of being the President of the United States - and he wanted his tombstone - which he designed himself before he died - to reflect that. In a very real way, Thomas Jefferson was the father of free public education in our country. Since then - public education has served two main purposes in America. It's been the great equalizer in our economy. An American - no matter how rich or poor they were born - could have access to the same quality public education - be given the same opportunities to learn about the world - and be given the same preparation for a good job. That at its core is what the American Dream is all about - and a quality public education is essential to making sure it doesn't disappear. I think by far the most important bill in our whole code is that for the diffusion of knowledge among the people. No other sure foundation can be devised, for the preservation of freedom and happiness...Preach, my dear Sir, a crusade against ignorance; establish & improve the law for educating the common people. Let our countrymen know that the people alone can protect us against these evils [of tyranny and oppression] and that the tax which will be paid for this purpose is not more than the thousandth part of what will be paid to kings, priests and nobles who will rise up among us if we leave the people in ignorance. Education ensures that the people are knowledgeable enough to make the right decisions - to cast the right votes - to preserve our democracy - and not fall for the seduction of Kings or Aristocrats who want to take us backward toward totalitarian rule. But what happens when quality education becomes a luxury for just the rich? When only the rich learn about economics, or history, or political science? Well...we're finding out right now. A new study out of Stanford shows that the gap in standardized testing scores between rich students and low-income students has increased 40% since the 1960’s when Governor Reagan first proposed ending free college education in California, launching a trend across America to make Abraham Lincoln's nearly-tuition-free Land Grant colleges expensive in state after state after state. And another study out of the University of Michigan shows that the gap between rich and low-income students when it comes to college completion - which is the single biggest factor when it comes to succeeding in our economy - has grown 50% since Reagan's presidency. As the New York Times reports, “The changes are tectonic, a result of social and economic processes unfolding over many decades”. What this basically means is - working class and poor people in America are not learning the whole history of this nation - and they're not learning about enough about basic economics that they can make informed choices among political candidates who are talking economics. That ignorance - gives the very wealthy in our society an enormous power to preach bogus economics - and to rewrite history to advance their own prosperity at the expense of the less-educated. And this is exactly what Jefferson warned us about. The staff of scholars...should evaluate social science textbooks, especially in economics, political science and sociology...The objective of such evaluation should be oriented toward restoring the balance essential to genuine academic freedom. This would include assurance of fair and factual treatment of our system of government and our enterprise system, its accomplishments, its basic relationship to individual rights and freedoms, and comparisons with the systems of socialism, fascism and communism. As a result - education has turned into a tool for corporate power - for the oligarchs. We have historically had education about our labor movements, about our historical tax rates and economics. We used to teach this stuff in school. Have you ever heard about the Pullman Porters? Or the Flint Sit-Down Strike? Or the Grange Movement? Or how and why the Pinkerton organization started? If you haven't, odds are you attended school in the United States after Reagan's presidency. And if you did know all those things, odds are you attended school in the United States before Reagan's presidency. Because things have fundamentally changed since the 1980s and we're no longer teaching the history of this country, that this country has a history of giving more and more rights to workers. For example, unionization. 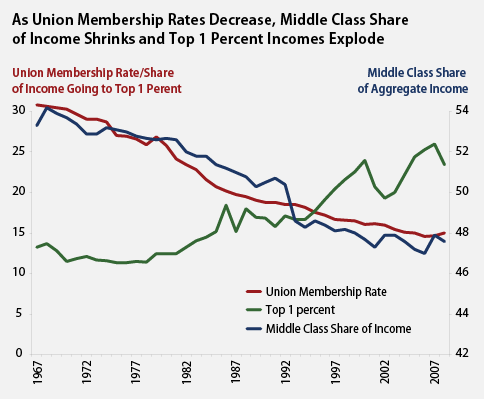 Actually, if we were to start back in the progressive era around 1880, 1890, you see unionization growing very, very slowly and then in the 1930s it jumped up here, but now since 1967, especially when Reagan came into power, we see the union movement crashing - union movement is the red line - and with it the income for the average worker crashing. And what's going up in terms of income? The top one percent. It's dramatic. Let's go to our next slide, here. Our top income tax rate, we haven't talked about tax, you know, historic income tax rates, and in fact, in many cases, what is so fascinating is, conservatives will start their conversations by saying, 'well, the tax rate, you know, it's the highest it's been since Reagan!' Well, yeah. That's Reagan, right there. But during this period of time since the 1930s til the 1980s, this was the time of greatest job creation. This was the time of solid job creation and this was the time when the average CEO was only making 30 times what the average working person did because we had a middle class. Reagan crashed this thing and ever since then the middle class has been in trouble and job creation has gone away. Let's move to the next one here. Here's the evidence of it. These are historic tax rates. 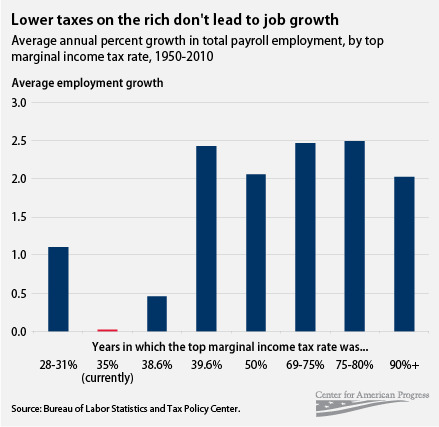 The tax rate was over 90%, the top marginal rate on the very rich, on average we were creating over 2 million jobs a year. When it was 75 to 80% it was almost 2 and a half million jobs a year. Same, 69-75%, you can see this right across. Here's where we are right now. Larry Beinhart did the research on this. When taxes, when tax rates on the rich are very high, you have a stable economy. When they get low you get a wild casino economy. Again, growth in real after-tax income from 1979 to 2007. Reagan said that trickle down economics would make everybody rich and everybody got out there and voted for him and believed it. Well, this is what trickle down economics has brought you. 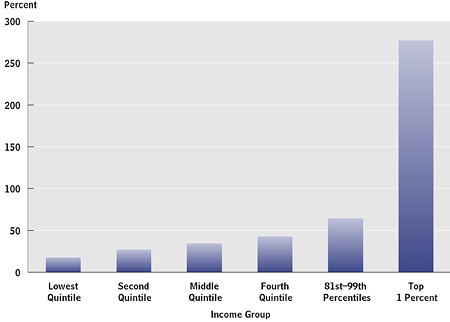 This is the bottom 20%, the next 20%, the third 20%, the fourth 20% and all of the last, the top 20% except for the top 1%, and this is the top 1%. From '70, basically the election of Reagan, til 2007. That's it for tonight's big picture tonight. For more information or to see any section of the show, check out our web site at ThomHartmann.com and don't forget democracy begins with you. Get out there and get active. Tag, you're it!